This list is different: I only focus on high quality, productivity-boosting iPad apps that improve the workflows across all subjects and levels of academia. Whether you are a college freshman in art history, a post-doc in life sciences, or a seasoned professor in business: I am sure you will find something here that helps you super-charging your academic life. In case you have missed the first two parts of this serious, be sure to check them out! The first part tells you all you need to know about Writing and Reading on the iPad, and the second part covers apps for Conceptualizing and Presenting ideas. But lets get started with the iPad apps for organizing and enjoying academic life: In order to give you a really good idea of how these iPad apps can enrich your academic workflows, I will briefly describe how each app can increase your productivity as a scholar. If you are using one of these apps already and want to share your own experiences with it, please don’t hold back! The comments are all yours. 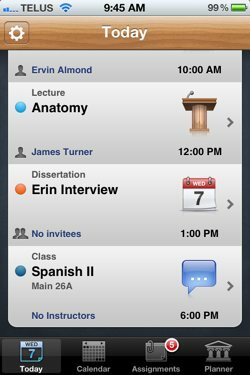 Organizing your courses: One great tool specifically designed for students to keep up with all their class assignments and meetings is iStudiez Pro ($3, iTunes link). For each of your courses, you can add class times, notes, assignments (including due dates and collaborators) and exam dates. Yes, you could do this in the standard iOS calendar. However, the benefit of using a dedicated app like iStudiez is that you won’t clutter your calendar or task manager with a ton of assignments and class times. iStudiez Pro is a universal app, which means it also works on your iPhone. The interview with Erin comes straight from my iOS calendar app. But how do you make iStudiez work with the stock iOS calendar app? All entries you put into the iOS calendar app will automatically show up in iStudiez. Note that the reverse isn’t true: iStudiez does not export its course-based data back into the iOS Calendar app. If you think about it, that would kind of defeat the purpose of keeping your main calendar clutter free, so I am totally okay with that. Especially since is possible to add iOS calendar events straight from iStudiez Pro. This feature is really helpful when you want to plan a meeting or some time off towards the end of your term, when you are swamped with assignments. Overall, iStudiez is a good app for students (and also for instructors) who want to organize their class work without cluttering other prorductivity apps. There is a free iStudiez Lite version (iTunes link) that you can try out before buying the full version. The free version is limited to three courses per semester. Calendar and task management: If you want to get even more organized, you can check out Pocket Informant Pro ($15, iTunes link). 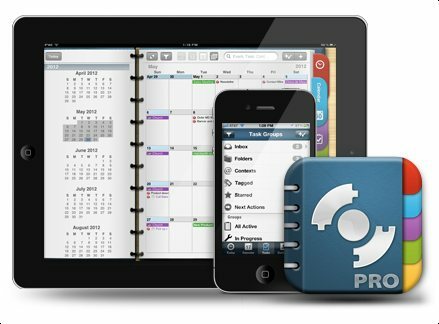 This app fully integrates with the iOS Calendar app and also throws notes and a task management system into the mix. You can sync your task with a free google or toodledo account, with the desktop versions of iCal and Outlook, or you can use Pocket Informant’s own (expensive) cloud sync for $15 per year. No doubt, that is an expensive solution, so is it worth it? Only if you are an absolute calendar and task management fanatic! I am not that kind of guy, and I admit that I am not using most of the features of this app. The developer recently released Pocket Informant Go! ($5, iTunes link) that promises to be the “little brother” of the main app. However, I find this one seriously underpowered for its hefty price tag (for example, it cannot sync with toodledo; see comparison chart here), but maybe you can pick it up on a discount some time. In short: Only consider Pocket Information Pro when you are really a pro in getting organized – otherwise there are cheaper solutions out there! Pocket Informant is really powerful, but also really expensive. Unless you are really a “Getting Organized Fanatic”, I would stay away from this app. I bought it in order to train myself getting more organized, but I am not using many of its functions. Calendars ($7, iTunes link) is such a cheaper solution, provided you are using Google’s Calendar and Tasks to get organized. It syncs with your Google account so that your data is available even when you are offline, and it also integrates with your iOS calendars to get the full picture of all your appointments. Why would you want to use both iOS and Google calendars? For example, you might use the iOS calendar for your own appointments, but some of your project groups use Google calendar to coordinate the work. With Calendars, you are fluently “bi-calendual”, making switching back and forth between calendars is a thing of the past! Long time planning: What I am missing with all these calendar iPad apps is a quick way to plan ahead how the rest of the year (or next year) is going to look like timewise. Sure, most calendar apps have a yearly overview that shows you how busy each day is, but this doesn’t give a feel for events that do not have concrete appointments (yet). For example, I would like to put the deadline for a conference submission into my calendar, and I want to mark the two weeks before that as time I will focus on getting my submission ready. How can I do this without adding a buch of fake mult-day appointments into my calendar? 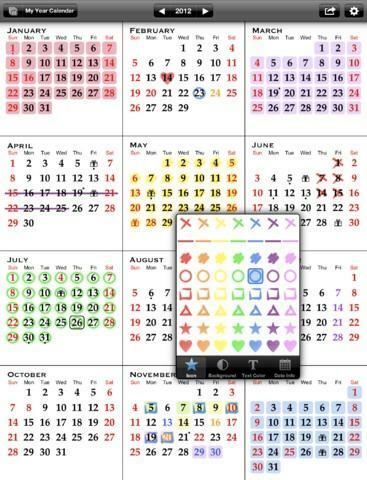 All-in-One Year Calendar ($5, iTunes link) lets you scribble in a yearly calendar (like the paper one that was next to your telephone or on the fridge in the old days). For example, I would add the conference deadline as an event, which can be synced to my normal calendar app on the iPad. In order to tell myself when I am focusing on getting the submission ready, I would markup the days before the event with a certain color code that tells me what project I am planning to work on. These mark-ups give me a bird’s eye view of my time, yet they stay out of my normal calendar to reduce clutter. All-in-One Year Planner is a great way to plan ahead: When are conference deadlines, when do you want to have a project finished, how many days should you put aside for it? For me, its low tech approach to project planning beats elaborate Gantt charts any day. Task management: If you are just looking for a simple task management app, then look no further than the free Wunderlist (iTunes link). This app is free, but that doesn’t stop it from being the maybe best (simple) task management app out there. It is not as powerful as Things ($20 for iPad version, iTunes link) or OmniFocus ($40 for iPad version, iTunes link), but it also doesn’t break the bank just for managing your tasks. Wunderlist is available for Mac, iPhone, iPad, Blackberry, Android, Windows, and the web – you name it! In my opinion, Wunderlist fits the bill for most academics, and only if you are more heavily involved in team projects or you need to add contexts and locations to your tasks (in other words: you are a Getting Things Done Samurai) you would need anything else but Wunderlist. You can read more about Wunderlist here. Getting out of bed: Life is tough as a student. With late night study groups and last-minute paper submissions, it sometimes seems to be impossible to get out of bed. In order to pull you out of your comfy feathers, you need an alarm clock as rigorous as your method section, but gentle enough to give you a smooth start into your day. Progressive Alarm Clock ($2, iTunes link) combines both aspects by waking you up slowly, with okay sounding bells that start faint but that become louder with each interval. Sountrack for your research: Rdio ($10 per month) is a music subscription service that lets you access, stream and download a huge catalogue of music completely ad-free. The app itself is free, but you have to be an active subscriber in order to continue listening to music. Rdio is not the only music subscription service (there are also MOG, Sony and Spotify; see comparison article here), and the main reason for me to choose Rdio was its availability in Canada. Streaming your music has a couple of benefits. First, you have instant access to music that helps you focus on your work (I turned into a huge fan of ambient classic, check out Max Richter!). In addition, streaming most of your music also frees up storage space on your mobile devices. For example, I figured that I do not need 64 GB storage space on my next iPad if I slimmed down my conventional Music catalogue by streaming most of my music. Buying a 32 GB instead of a 64 GB iPad saves me $100 plus tax, so the first 10 months of my Rdio subscription are already paid for. Extra screen estate: AirDisplay ($10, iTunes link) lets you use your iPad (and iPhone) as an additional display for your Mac or Windows computer (don’t forget to switch off Mirror Display). The connection happens via WiFi so that you don’t have to deal with extra cables. I am a little surprised about the somehow low rating this app has right now in the App Store, as for me it runs without any problems. The refresh rate has become pretty good over the last few years, and the external iPad display is entirely usable for typing text and watching online videos. Also, don’t forget that your iPad is still a tablet computer. For example, you can control apps through touch inputs, or you can draw with your finger or stylus in graphic apps. 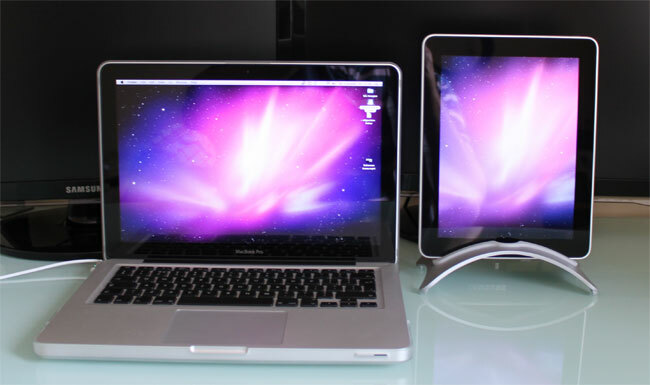 AirDisplay transforms your iPad into a second screen for your Mac or PC. Pretty handy when you are travelling around, but you are used to have a two screen setup in your office. So here they are: My personal favorite 30 iPad apps for college students, professors and everybody else in academia. I hope you find them interesting and helpful for your own academic work. If you liked this post, please take a second to share it with your colleagues and friends. You can use the share buttons on the side or the end, or you can retweet the post below to send your friends to the first part of this series. For more cool ideas on how to use your iPad in research, teaching and learning, please stay in touch and Follow @academiPad on twitter, join academiPad’s RSS feed, put your email down for the free academiPad email channel, or best: all of the above. Once you have all the iPad apps you need for research and school, it is time to think about how you can expand your iPad’s capabilities with accessories. Whats the deal with all these keyboards and styluses for iPads?! Check out academiPad’s posts on how to turn your iPad into the ultimate writing machine and what stylus is optimized for people in academia. But before you leave this post, I would like to hear about your favorite app or workflow. Maybe it is mentioned here, or maybe it is something that should be mentioned here? Don’t forget, academiPad is a platform for sharing ideas. Please tell me and all other readers about your favorite apps in the comments. I’ve just posted anything about you on my twitter account, I truly appreciated the study and hope you are going to post even more. one more question, have you been on facebook? I will add you like a close friend. Thanks! I too love streaming music while I work. I love Debussy and Ravel. I had not thought of the memory savings. I was curious about the fact that there are no learning apps on the list. Do you think that college students feel they are too old to download an instructional app? Are there any instructional apps that students use on a regular basis? The reason why there are no learning apps on the list is that these apps are subject specific. I wanted to compile a list that is useful for higher ed participants of all levels (undergrad to full professor) in all disciplines. Apps like Elements are great, but not useful for someone in the humanities. I enjoyed the article and am downloading wunderlist now! Thanks for all the great app suggestions! You are very welcome – glad it is helpful. Just because I’m a student with an iPad does not mean I’m going to buy a bunch of “maybe” apps. How about an article on Free apps. Korin, you are welcome to write this article as a guest post on academiPad. The point of the above list is exactly to take the maybe out of the apps, since academiPad only recommend apps that are found useful after trying them out.